How to convert and split video for MAC? Why we need a MAC video splitter? MAC, which is short for MACintosh, is exclusively designed by Apple Inc.. It is different from the OS of MS Windows and usually cannot be installed in the other PC. Because of the differences in operation systems, not all softwares are compatible with MAC, which leads to the result that some video formats cannot be read in OS of MAC. Then we need to convert them into formats which MAC supports. Meanwhile, MAC may set limits for the file size of videos, in order to view, edit or share the videos, we have to split video files for MAC. As MAC has been becoming more and more popular, it is calling for a software to solve the problems of format conversion and video split. idoo Video Editor is a video editing software which integrated powerful function of format conversion. And it is also able to split video for MAC easily. And we will introduce you how to use this video splitter for MAC. First of all, you need to know what is your MAC devices, for example, iPhone, iPod or iPad, then to decide which format to convert into. You may select the file formats for MAC in the conversion list, then set the file size or time span of the output files, then set and split them in “Splitter” function. Here is the guidance to conversion of files into formats for MAC. a. 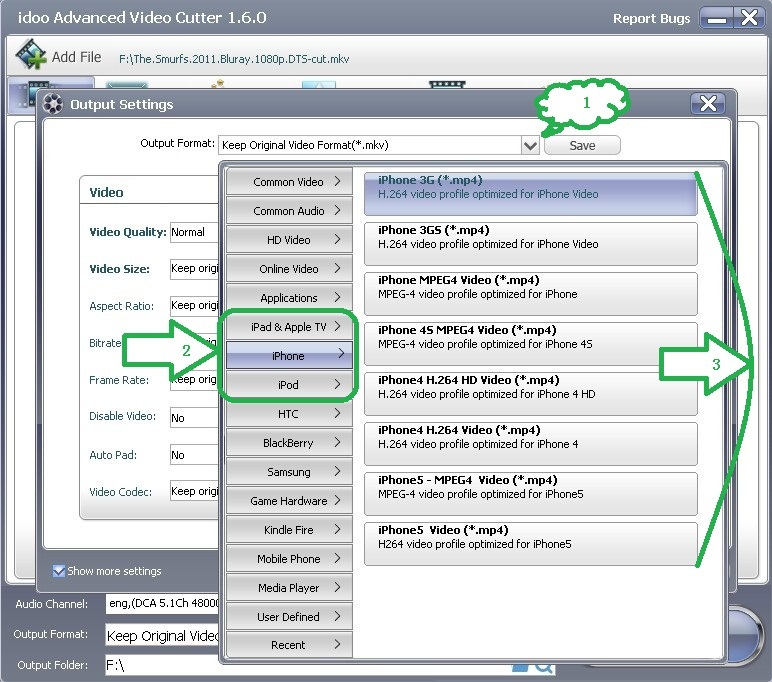 Open the function of “Advanced Video Cutter”, add your video file and click “Output Settings”. b. Click the drag-down list of “Output Format” (Tag1). c. The areas in the list (Tag 2) are various formats for MAC. d. Select the file format you need from those formats for MAC (Tag 3). After that, we may further edit this video or click "Start" to complete the editing. Please check the related articles for more information. How to convert and split video for MAC? How to split audio from video? How to split AVI video? How to split movie by idoo video editor? How to split MP4 video files according to the time span? How to cut WMV video? How to cut MP4 video? How to cut MOV files? How to cut video clips? How to cut split video for YouTube? How to cut and effect video? How to easily cut AVI video? How to cut 3GP?